Whiteside Template Bits with Oversized Bearing is fitted with a bearing that is oversized when compared to the cutter, making it ideal for template work for your next DIY project. 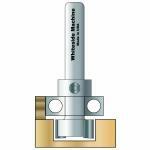 Whiteside Template Bits with Oversized Bearings work with a number of popular routing jigs including Porter-Cable Morten, Mortise and Tenon . Choose from the available shanks and diameters below to add a new Whiteside Template Bits with Oversized Bearings to your collection of woodworking tools today. 5/16" 3/4" 2-3/4" 1/4" 1/2"
1/2" 1/4" 1-7/8" 1/4" 5/8"
1/2" 1/4" 1-7/8" 1/4" 3/4"
9/16" 3/4" 2-1/4" 1/4" 5/8"